Unique per-document pricing leverages the power of predictive coding and saves clients between 20% and 50% as compared to traditional linear review services. Consilio has provided review services in Asia, Europe and the Americas for years and leverages this local expertise for our clients every day. 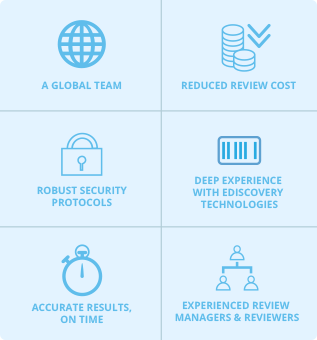 Our experienced review managers optimize workflows using advanced technologies to lower review costs. Consilio’s pool of skilled legal professionals has proven experience performing document review, ranging from simple responsiveness coding to complex and specialized decision making. Our global reach enables our clients to quickly staff any project with qualified, multilingual reviewers for complex reviews. Expert recruiters with local market expertise can staff projects in as little as 24 hours. Access to a database with thousands of prescreened, multilingual law professionals. To learn more about Staffing, contact us. Interested in joining the Consilio Review Team? Click to submit your resume. Consilio’s Coordinated Review service is designed for clients who need to maintain control over the review workflow yet require a layer of support to ensure the project stays on track. Dedicated review coordinator to support the project administratively by liaising between the overseeing attorney and the review team. Option to select a quality control (QC) protocol from a pre-packaged menu of choices. Choice to conduct the review in-house or select from our global network of review centers. To find out more about our review center locations, click here. To learn more about Coordinated Review, contact us. 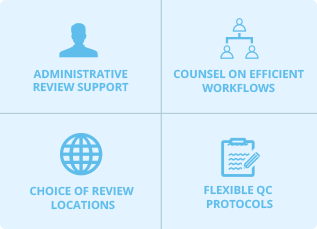 To lower review costs and improve the efficiency and accuracy of document review, Consilio offers Comprehensive Managed Review, a service that combines review management expertise, access to thousands of highly efficient reviewers, workflow best practices and quality assurance protocols. The ability to lower review costs by selecting from a variety of pricing options, choosing a lower cost review site and leveraging workflow best practices. Trustworthy expert recruiters who source and secure the best reviewers for the project. Access to secure review centers around the globe, each designed to promote productivity. Knowledge of advanced technologies used to prioritize and classify relevant documents for your review. The experience of a senior director sponsor who will supervise every phase of your project to ensure deadlines are met and quality is maintained. An international law firm required five trilingual contract lawyers—native or near native Russian, German and English speakers. The reviewers would be based at the firm’s Munich offices, and Consilio was given five days to find appropriate resources. Consilio was able to secure reviewers to the Client’s satisfaction in only three days—allowing the review to begin two days ahead of schedule. A multinational electronics manufacturer required review services using the company’s self-hosted data room (a third-party tool). The project initially required a team of 15 bilingual (German/English) reviewers secured by Consilio within 48 hours. Soon after the project began, the scope expanded requiring an additional set of 40 reviewers. In response, Consilio activated reviewer terminals in our New York review center and managed the network and data access. As a result, the client was able to meet tight deadlines and keep data secure. A multinational automotive manufacturer turned to Consilio to assist with the response to a foreign corrupt practices investigation originating out of Japan. After the initial phase of the matter concluded, the global investigation led to subsequent data stores. Consilio was called upon to provide 15 reviewers in Tokyo, 25 reviewers in London, 15 reviewers in Belgium and 50 reviewers in the U.S., all connecting back to the core Japanese review effort. Consilio was able to keep the review on track by successfully managing reviewers spread across time zones, accessing data stores in different locations and effectively communicating with a culturally diverse group of law firms. A multinational food producer required the review of millions of processed documents in response to a U.S. federal government subpoena. By leveraging Consilio’s Comprehensive Managed Review service with the per-document pricing option, the client was able to gain upfront expense predictability, with a faster review at significant savings as compared to the client’s next best alternative.